MOSCOW, November 20. /TASS/. The Russian Northern Fleet’s large anti-submarine warfare ship Vice-Admiral Kulakov has passed through the Suez Canal and entered the Red Sea as part of its long-distance mission, Fleet spokesman Captain First Rank Vadim Serga said on Friday. “The large anti-submarine warfare ship has large experience of anti-piracy activity and the accomplishment of tasks for providing safe navigation for merchant ships in the Gulf of Aden. The ship successfully performed the relevant missions in 2012,” the spokesman said. The ship crew held exercises on its board on Thursday to practice vessel survivability, and also carried out a training drill for its anti-terror group, during which the marine infantry practiced tasks to inspect a simulated non-compliant vessel and use small arms against notional terrorists. 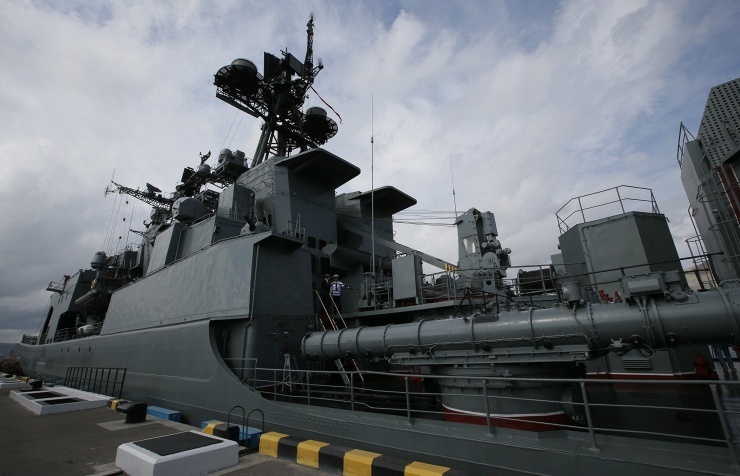 The large anti-submarine warfare ship Vice-Admiral Kulakov left for a long-distance mission on October 23, covering a distance of over 5,500 nautical miles during the voyage.